› Stainless Steel Gates And Grills..
› Sheet Metal Powder Coated..
Imperial Industries provides CNC laser cutting, marking and sheet metal fabrication services of an unparalleled standard. From a one-off product for the prototype stage to high volume needs requiring full-scale production, we do all laser cutting jobs as per your specification. We primarily work with MILD STEEL, STAINLESS STEEL, ALUMINIUM, COPPER, BRASS, TITANIUM to provide bespoke CNC laser cutting service to meet individual clients’ requirements while following a strict schedule. 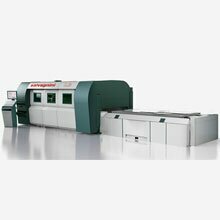 Laser cutting is the technology that uses a intense laser to cut metal. The word "laser" stands for "light amplification by stimulated emission of radiation" - a process that works by stimulated emission. It is manifested in the form of a beam that can be manipulated with various reflective surfaces. Custom laser cut parts produces greater consistency from part to part. Precision sheet metal parts can be made by laser cutting the parts due to the ability to hold tighter tolerances. Laser cutting gives you cleaner, burr-free cuts, quicker production, minimal operator intervention and greater accuracy which equates to less wasted metal & time. This lower costs to the manufacturer & results in a savings to the customer. Processing tolerance can be guaranteed at 0.005. Imperial Industries can cover all your MILD STEEL, STAINLESS STEEL, ALUMINIUM-BENDING needs up to small thickness of 5- 6mm. Our advanced equipment offers accurate forming, folding and rolling services to virtually eliminate any kind of distortion when the metal is under process. It comes with a variety of tools that give exceptional accuracy, repeatability and quality control over a wide range of bend types and depths like 45, 90 bends, L-shapes, deep bending and radius bending . Sheet metal or plate can be bent easily with simple fixtures using a press. 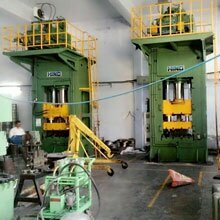 This machine utilizes long dies in a mechanical or hydraulic press and is suitable for small production runs. The tooling is normally simple and adaptable to a wide variety of shapes. 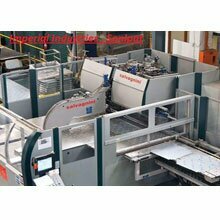 World Class CNC Panel Bending was elevated at Imperial Industries when we added our Salvagini P4. This state of the art panel bending machine has automatic loading of sheet metal from a 12 tower sheet metal loading station. It pulls the material out of rack based on what program tells the machine to retrieve. It punches and forms with precision and speed unmatched by turret presses and press brakes. The additional beauty of the Salvagini panel bender is that it loads, references, locates, punches and forms without human touch of the material until the part is formed. Tight tolerances are able to be obtained. This makes Imperial Industries a preferred supplier for production panel bent parts such as custom metal enclosures, metal cabinets, and metal shelving assemblies in aluminum, stainless steel or carbon steel. Drawers with hems and flanges are no problem for us. Special tooling is not required for many functions of this CNC Panel bender. If you have panel doors with louvers, that is ok too! As a complementary service to our laser cutting and bending solutions, we are happy to be able to provide a complete metal welding and fabrication service. our machine can give strength and finish to mild aluminum, acrylics, brass, mild steel and stainless steel products in small and large batch work. 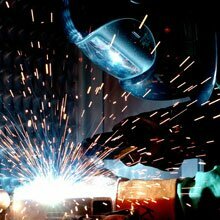 we cover highspeed assembly, cnc punching, drilling, tapping, machining and fitting welding operations. A. Better capability at all positions. B. Higher deposition rates than shielded metal arc welding. C. Flexibility to make long welds without starts and stops. D. Leaves minimal residue, which reduces the need of post weld cleaning. B. No sparks, spatter or fumes. C. Use one shielding gas (Argon) for all applications. D. The welds can be made in all the positions with or without filler metal. 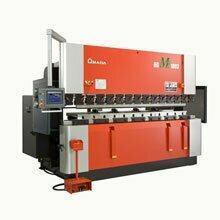 E. Precise control of welding variable such as heat. The company has installed advanced HIND ,& SPM press lines for performing various intricate metal forming operations as per customer requirements. The press line is a battery of presses including Link Motion, Mechanical, Hydraulic and Power presses ranging from 5 ton to 300 ton.